These Top 10 SEO tactics for new websites come from a combination of my experiences trying to rank my site with some knowledge of SEO and all of my subsequent training and experience as an SEO specialist. This is a megasized guide but it’s worth it. I wish I had known all of these when I was getting started. But life is full of trial and error and now I can share all of my knowledge with you, my kind reader! 1. 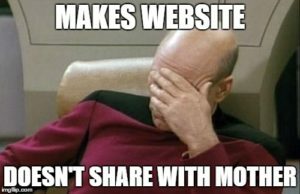 If you don’t have a website, make it today! I know this one might seem to redundant for those of you who already have a website, but it’s important to drive home that if you don’t have one, you should make it right away. Websites are like a fine wine: the more they age, the better they do. Why? Because Google takes domain age into consideration when ranking websites (a general concept for how your website is ranked is known as domain authority). This means newer websites have more trouble ranking than older, established ones. Even if you are just setting up a one page site for the time being, it’s worth doing today. You can expand your website as you need to later on. But by doing it today, you start the aging process immediately. Free tip: if you want to rank well in Google, you need an actual domain name purchased from a site like GoDaddy as well as hosting (which can be done through GoDaddy). While this might cost you about $80 a year, it’s worth it if you are serious about SEO. Creating a website on a site that hosts it for you like wix or fullslate will severely limit your potential to grow your website in the future. Second free tip: Don’t pay for GoDaddy’s website builder or anything like that. With a tiny amount of work, you can set up WordPress for your site and it’s free. If that’s too complicated for you, contact me and I’ll do it for $30 CAD (for you Americans that’s like $5 bucks now), much less than their monthly website builder fees of $10 a month indefinitely. Third free tip: Once your site is built, immediately send it to the Google Search Console for indexing. That way it will get added to Google search results right away instead of whenever the Google spider happens to find it. Once you have a basic site set up, you are going to need to pick one or two keywords to try rank for your home page. While you could try for more, what’s important is that they all fit into your website’s title tag. This is the hyperlinked text that shows up in Google search results. For example, my keywords are Toronto Freelance Writer & SEO Specialist and my title tag is Freelance Toronto Copywriter & SEO Specialist | Ryan MacKellar, which fits into the 60 character length of the title tag. You can test the size of your title tag using this free tool. In general, it’s best to choose keywords that are two-three words long because they give more information about the user’s intent. How do you pick your keywords? There are a few ways. The first is just understanding what your business goals are and what the mindset of your customers might be when they search. Then, use a free keyword research tool (which tells you what people are searching) to make sure they align with a customer’s search term. Remember, the words we use to describe our business might not be the same as a customer’s. While that’s a great option for the more savvy of you, it can seem intimidating. Another option you can pursue is to take a look at what your competition is trying to rank for and copying their keywords. Only do this if it looks like your competitor knows what they are doing (look for the | symbol for someone who knows how to optimize a title tag). Finally, a quick word of warning. 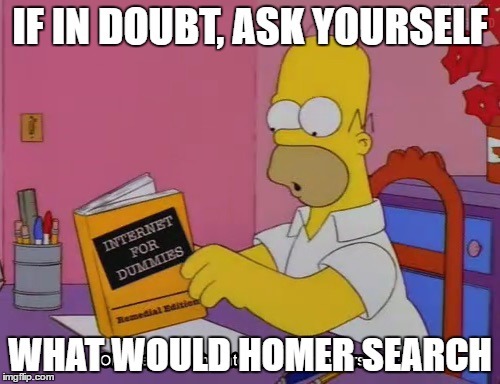 It’s the internet and it’s all been done before. Ranking in Google is not easy, especially if you are in a competitive space. It’s always easier to rank for niche keywords than ones with a lot of traffic. Free tip: make sure that all of your on-page elements are optimized for these keywords. There’s a lot to pay attention to, so I won’t go into the details here. Instead I’ll give you this excellent on-page resource. Second free tip: Since you are a new website, focus all of your effort on getting those homepage keywords to rank, Making additional webpages with optimized keywords can be done later when your homepage is ranking well. You have enough work cut out for you for the time being. Third tip: You can always tweak your keywords later, so don’t sweat this part too much if you are unsure. Just pick something that seems to make sense and you can change it later on. Now that you have a URL and a couple of keywords, it’s time to get some links. This is a critical step. When I made my website back in February, I was on the fourth page for my name. It was demoralizing. What kind of SEO specialist can’t even rank for their own name? (P.S. I’m still not #1, but I’m moving up every week. Damn you hockey superstar Ryan MacKellar of the Odessa Jackalopes). But once I got some decent links to my site, I noticed an improvement in how I was ranking on Google immediately. Wondering what a link is? It’s hyperlinked text from one webpage to another, whether from your site to an external site, your site to another page on your website, or from an external site to your own. When someone from another website links to your own, that sends positive signals to Google that your website is legitimate and boosts your domain authority (remember that concept from the first tip). How do you get yourself some links? It’s easier said than done. For this website, I built myself some using old blogs I used to run and online directories (e.g. Fyple, Viesearch). While online directories aren’t the best, it’s a good way to get started building a natural backlink profile. Note that I would not recommend paying for any. There are always free options. There are better links out there, but they require work and some creativity. It all depends on the kind of business you run and the relationships you have. If you are a new local business, reach out to a community newspaper and see if they will write a profile about you. If you have suppliers, ask them for a link. Your local business improvement association is also a good place to get a link. Content can also get links. I’m hoping this blog post might generate some links due to its in-depth approach, lack of competition on the topic and quality memes (yes my jokes are funny). First tip: Patience is key. 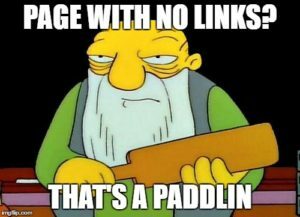 If you try to build too many links at once, that sends negative signals to Google that you are up to no good and you do not want that. Build links slowly and gradually for best results. Second tip: Don’t just go all out on directory links. Having links from a variety of sources (think blogs, directories, business associations etc) makes your profile look much more legitimate in Google’s eyes and you will rank better. While this might seem like a technical challenge that is over your head, it’s really easy and it will definitely improve the ranking of your website. I noticed a slight boost in my ranking immediately after I implemented this. Schema is a snippet of code that you should add to your page. It provides contextual information to Google about what your business actually is because Google spiders can sometimes struggle to tell what purpose your website serves when looking through text. Fortunately, it is very easy to implement schema. If you are using WordPress, there is a free schema generator plugin that makes it easy peasy. If you have a custom website built with code, it can be a bit more of challenge. The code is easy to create, but putting it in the wrong spot could mean it doesn’t work. Paying a web developer to implement this code for you is your best bet. Getting traffic on your website and social media shares is another crucial tactic for new websites. Having your website validated by positive traffic metrics and shares in the social space makes it look more legitimate. It also has the added bonus of driving potential customers to your website. So don’t be shy and tell the world you exist. Put your site on your Facebook page, Linkedin account, Twitter and more! There’s more you can do to help boost your traffic and social media presence. For example, if you have a personal email, setting up an email signature with your URL is a good idea. You should also set up social media pages for your business and try to get any new customers to follow your page. Free tip: Before for you do this, make sure you set up Google Analytics. You want to be able to monitor any traffic that comes to your site so that you have the data to make improvements in the future. Here’s some information on how to do it. 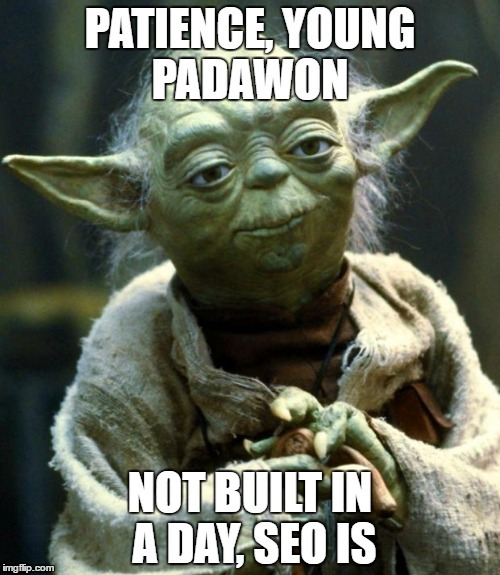 This is what I’m doing in this post (the keyword is SEO Tips for New Websites). Having a blog is a lot of work for small business owners and it might not be worth your effort if you don’t have the time or money. But if you have an interest or a bit of money to pay a freelancer like myself, it’s totally worth your effort. Blogging has a few benefits. First, it tells potential customers on your website what your business is about and other information they might want. Blogs have generally been shown to boost conversion rates. In addition, you can try to rank for more niche, information keywords that will drive organic traffic to your site. Even if these customers don’t convert at a high rate, this additional traffic will boost your domain authority. Adding fresh content to your site also helps in that regard. Finally, blogs have an added benefit of allowing you to link to other pages on your site. This lowers your bounce rate and can boost your ranking for those crucial homepage keywords. More on that subject below! Free tip: Once you have a blog and plan on growing it, you are definitely going to need a sitemap as soon as possible. Sitemaps make it easy for Google spiders to crawl your entire site. If you are on WordPress, all you need to do is add the Yoast SEO plugin. This plugin has other benefits as well. Linking is so important in the Google universe and not just because it makes life easier for the user. So link generously, both internally and externally. On every page on your website, you want to make sure you are linking to another page or two on your website. Ideally, these would be pages you are trying to rank. Since you are just getting started, that likely means the homepage. As mentioned above, this is one of the benefits of having a blog since it gives your pages that you can link back from your homepage. The benefits of internal linking can be substantial. I have noticed a big improvement for some of my client’s websites after adding internal links to all pages. In addition, some SEO specialists believe that linking out to high authority websites (think Wikipedia, reputable news sources and industry associations) also benefits your search rankings. The theory behind that is if you are linking out to legitimate sites, it suggests to Google that your site is also legitimate. Free tip: When linking internally, use natural language for your anchor text (anchor text is the text that is part of the hyperlink) that contain some of your keyword. For example, if I were to link back to home page, some good anchor text would be: Ryan MacKellar has been working in SEO for 2 years at a marketing agency in Toronto. Google will penalize any website that has over-optimized anchor. When people build websites, they can sometimes get carried away. They want this pretty picture here and this background video on the homepage there. While that’s all fine and dandy, it can impact your search results if not done properly because it increases the amount of time it takes for your page to load. Google prefers sites that load quickly. Fortunately, Google created this handy tool to evaluate the loading speed of a page on your site. This is known as Google page speed insights. While some of the results will be more technical, there are likely two that you can do something about yourself. First, if you cheaped out on hosting solutions, Google might tell you that your server speed is too slow. I used GoDaddy hosting and have not experienced issues. If you are getting this message, it’s probably worth it to switch to another hosting provider. Second, you have media files that are too large. If it’s photos, you can reduce their size in paint or use this handy WordPress plugin (notice how WordPress has a plugin for everything). If you have a video file, try to use a compressed version or perhaps consider moving it to another less important page. Remember when I told you to set Google analytics? Here is the payoff. After a few months, evaluate. Where is your traffic coming from? 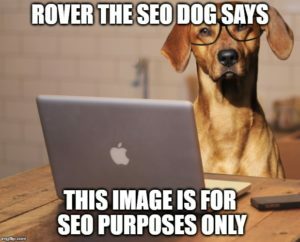 Is your bounce rate too high? What pages are users heading to after the homepage? Are they converting at a high enough rate? You can answer all of these questions using your data. You’ll want to try and address issues like these early on, especially with regards to your bounce rate. A high bounce rate, for example, sends negative signals to Google that your site isn’t what the user is looking for and will hurt your rankings. Assuming you aren’t a spammer who is misleading users, one tactic is add a big button on your homepage telling your user to do something. Whether it’s to check out your blog or request a quote, a button driving users there can make a big difference. Traffic source information can also be very helpful. From there you can figure out how people are getting to your site and even track this traffic category’s conversion rate. For example, if your Facebook traffic has the highest conversion rate, that lets you know you should devote more resources to that platform. You should also check Google Search Console to see what pages are receiving clicks. 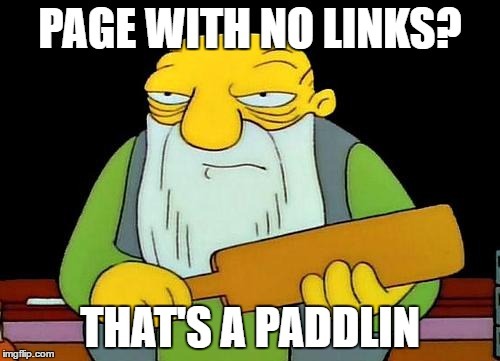 You thought you were done with the challenge of link building. Haha! You wish! 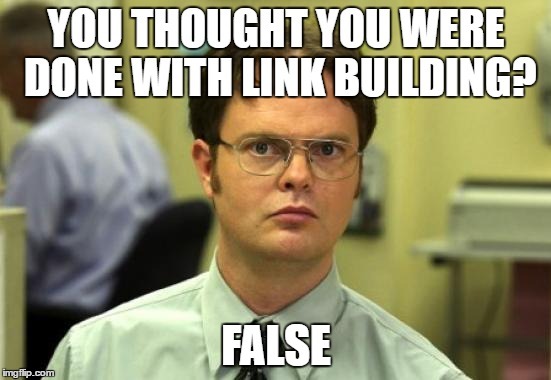 Link building is never done if you are serious about SEO. As the time goes by, you should continue to use directories as a baseline, get a Google My Business listing and try to list your business elsewhere on Yelp and other business listings (known as citations). Getting some nofollow links (if you don’t know what this is don’t worry, you will get them naturally if you are doing any outreach) is also beneficial. But again get more creative. I can’t tell you how to get links because there are so many ways. But you need to leverage whatever relationships you can build and cultivate. Those are going to get you the links that are really going to take your rankings to the next level. Here’s a great resource on link building if you want to know more, but it’s a beast and link building can be hard to wrap your head around. You can always message me for some brainstorming. I hope you have made it all the way through this marathon of a guide. Before you embark on your mission, it’s crucial you know that SEO takes a long-term commitment from you if you really want success. The results, however, can totally work. I know of many businesses that have thrived entirely off of organic search results bringing them customers. So I encourage you to make SEO a priority. Whether you want to devote the time yourself or pay a freelancer like me to do it for you, it can really bring results if done properly. If you have any questions, feel free to comment or you can reach me via my contact form.